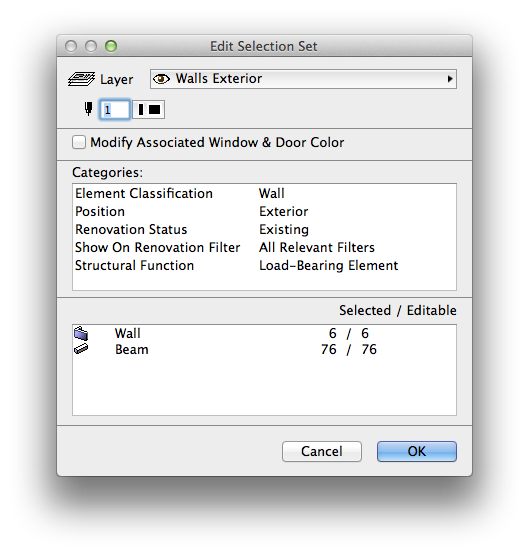 It is technically possible to model almost any feature of a building with almost any of ARCHICAD’s Tools. Imagine a model done with only the Wall Tool or the Roof Tool or the Column Tool. Some geometry would be terribly hard, but it’d be doable. I bet the exercise of trying to model a house using only the Beam Tool would be super informative. It’d teach you so much about both geometry and data (you couldn’t rely on scheduling by Tool type to differentiate your schedules and you could also easily schedule EVERY element you create in the same schedule, showing the same text based and geometric based data). It’d also probably show you that, while doing an entire project with one Tool is an interesting mental exercise, it is also crazy. That said, don’t discount any Tool for any modeling challenge. Do not avoid a Tool just because you have never used it or you don’t think it’s appropriate; it may just end up being the best solution. The least likely Tool might yield the best solution. When faced with a modeling decision, one must not jump straight to a specific Tool because “it’s your favorite”. I cringe whenever I hear phrases like “I hate Tool ‘x’, I ALWAYS model ‘y’ with Tool ‘z’ instead”. Clearly there is merit to having a system or a preferred way of doing things. If you “always” do something a certain way, you will be more efficient at performing the task. 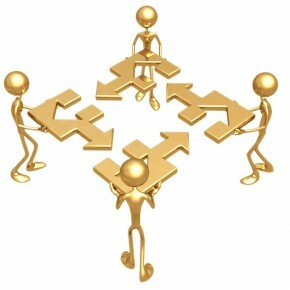 And in general there is a benefit to having a group of similar elements modeled consistently with the same Tool (if you have 40 joists, odds are you want to model them all the same way, rather than reinventing your modeling solution ever five elements). But approaching every design problem the same way with the same Tools without critical evaluation of what is best for the project is a mistake. Standard solutions are valuable, but generic defaults can also limit creativity. The right Tool is about element creation AND maintenance. There are ultimately two levels to analyze Tool and modeling method choices. First, what Tool or technique is best for the individual element. Second, what Tool or technique is best for the project? The overall model needs outweigh what may be easier for a small portion of the project. Another way to say this is to think about both local and global repercussions of your modeling decisions. In the above image there are two separate porch conditions using different Tools and model strategies. On the left, the low wall and beam/header use Composite based Walls so that the plan, elevation and sections clean up neatly. Building Materials and Surfaces all heal. The openings (both rectangular and arched) are created with empty opening Windows (Rectangular Window Opening and Arch Top Window Opening with the masonry arch turned on). Since the construction method is identical between the main structure and the guard rail and porch beams, the Tool used is identical. The masonry arch option on a curved top window allows us to replicate a typical masonry detail we might otherwise struggle with if we created this geometry with a different set of Tools. On the right, the porch components are framing elements and should not heal with the walls of the main structure. We are modeling discrete elements rather than a field of brick. For this, Columns and Beams have been used for the guard rail and porch posts. Beams and Columns for porches like this are easy to manipulate and re-space; Align and Distribute are indispensable for adding or removing posts, cables, or other evenly spaced elements. With the proper relationship of Building Material priorities, the dimensional lumber of the Beams can be set to cut the brick of the house walls. Looking again at these two conditions, we could describe the Wall based solution as a design that is a solid containing voids; a design where the positive space is dominant; a design that starts with a volume and then has mass subtracted. The the Beam and Column based solution is the opposite: a design composed of elements within a field; a design primarily about the left over space; a design about adding material. Had we made the Tool decision solely on this archetypal relationship between solid and void, we’d immediately know which porch should be Walls (with holes added) and which should be empty space with individual elements added to it. Of course looking at these two porches from the lens of architectural design is but a starting point. The theory and the best modeling solution align. Had the modeling challenge been different, we might have had to take the analysis a step further. For instance, if instead of square posts we had turned posts with a section that changed across the height of the post, we’d need to look at Complex Profile Walls. But that would be a secondary decision reached once we concluded that the Wall Tool as a linear extrusion was not the answer. One of the amazing aspects of ARCHICAD is the variety of Tools and features. This allows us to model one thing with many different techniques. This variety however needs to be balanced with uniformity as consistency is also key to a successful model and design process. Using the same Tool for the same function consistently throughout a model has many merits. As does using the same technique across multiple projects. Using consistent methods allows for smoother collaboration with other design team members and consultants. 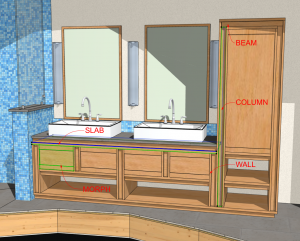 It takes the guesswork out when every beam, wall, floor, roof, and column is modeled and documented with the same technique (or at least the general case is the same, there are always exceptions). If a coworker jumps into your project to help, neither of you need to worry. In the example above, if the post and beam porch required two of the posts to be modeled in a unique way (say the Shell or Morph Tool for some reason), it makes sense to model the third post with the same Tool, even if the geometric constraints don’t require it. This way when one is working on the porch, the ARCHICAD user can think about all the posts in the same way. It’s for similar reasons that even if some beams could be Walls and others Beams, it is worthwhile to model them all with the same Tool, even if only a few NEED to be done with a particular solution. Managing model content and data is much easier when model techniques are consistent. We are all aware (or should be), that there are few settings that can be changed simultaneously with selection sets containing different element types (using Edit Selection Set: cmd+opt+T). But for a deeper level of mass change, only one Tool type can be modified at once (via the Info Box or cmd+T). So if all beams, headers and bulkheads are modeled with the same Tool, editing and adjusting them as a group is much simpler. If trim is modeled with Beams and Columns, it should be done that way consistently. This will allow you to manage entire sets of geometry and data in groups and successfully depend on parameter transfer (ei, the eyedropper and syringe). There’s one more reason why modeling a given set of elements with the same Tool has added merit. Elements schedule much easier when they use the same Tool. Through the use of IFC, we can literally schedule any elements together, regardless of Tool type; however, non-IFC fields may vary or be unavailable for different Tools. For example, only a few Tools will schedule with a relationship to Zones. So if you have a cabinet hardware schedule, and some hardware components are modeled with Morphs and others with Objects, the Morphs will not be related to a Zone and will show as a “-” in the Zone Name column of the schedule. 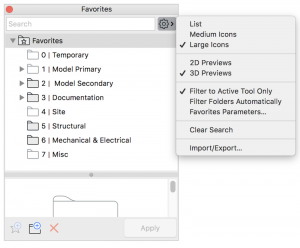 The merits of one Tool need to be weighed against other options if you really want to leverage the full advantage of ARCHICAD’s incredible flexibility. That means considering both the geometric and data possibilities of a given Tool (Can it model a particular form? is it Zone aware? Can I schedule its length? Can the resultant element be rotated in the X, Y, and Z axis?) This means you need to master each Tool and gain a thorough understanding of all its parameters. Even simple tasks of basic model development should be performed thoughtfully and deliberately. 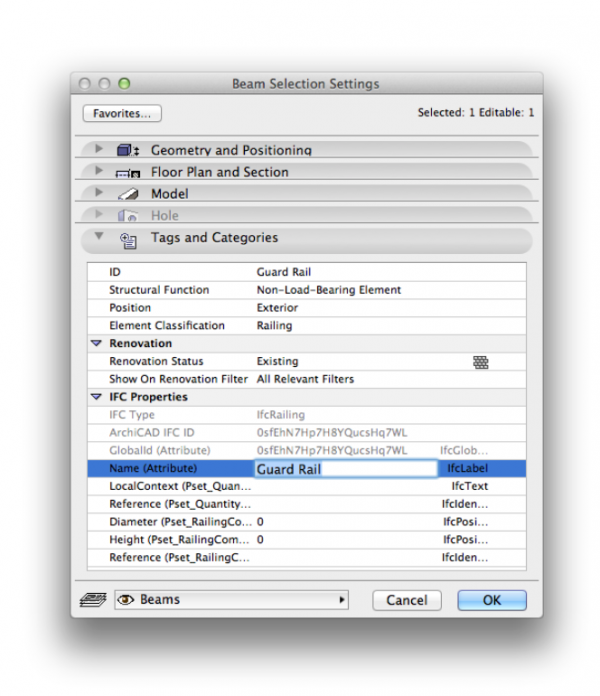 Once each Tool is fully understood, selecting the right Tool will be easy; but don’t start by assuming every beam will use the Beam Tool, or that the Beam Tool is only for beams. This is the third post where we’ve discussed which Tool to use. And there’s at least a fourth one coming. However, this is a good moment to pause and differentiate between Tool and technique. There are a lot of different ways to use the various Tools. And there are a lot of features available in ARCHICAD to further affect the elements created by the design Tools. For instance, we might create window trim with Columns. We might then affect those elements by using Solid Element Operations or Trim to Roof/Shell, or control their visibility through intelligent Layer control, Renovation Filters, and Partial Structural Display. And starting in ARCHICAD 20, we might begin to use Graphic Overrides, too. Picking the right Tool is just part of the solution. We also need to know how to use that Tool properly, both within it’s settings and in conjunction with it’s surrounding environment.